Few aspects of your home are as critical to the long-term performance of your roof as its ventilation. Ventilation for the roof and the attic space directly under it can be accomplished using various products and techniques. Indeed, there are an abundance of roof ventilation options for you to wade through. The good news is that once you’ve made your decision, a vented attic works for any home – in hot climates, mixed climates, and cold climates. When executed properly, adding ventilation can reduce your energy bill, save you hundreds of dollars in repair costs, and even lengthen the life of your roof. In order to maintain appropriate moisture and temperature levels in the top portion of your home, proper roofing ventilation is required. But getting started on the project can be overwhelming. There are many roof ventilation options that you can buy and have installed. Learning the basics of roof ventilation can help you make a more educated decision. Know that both intake and exhaust vents are necessary for proper ventilation. Cool air must be allowed to flow into the attic while hot air flows out. When installed properly, ventilation will prevent ice dams and unwanted moisture in the winter. And in the summer, properly installed vents will expel solar-heated hot air from the attic or roof and relieve strain on your air conditioning unit. One option you may consider is mechanized attic vents that are powered electrically. Mechanized vents may be intake or exhaust vents depending on the direction of the vent’s rotor. When in operation, the vent either draws air into the space or pushes it out. More common than mechanized vents are non-mechanical vents that work without the aid of a motor. There are numerous types of non-mechanical vents, including gable vents, ridge vents, soffit vents, and in-roof vents. A ridge vent is a ventilation strip that is placed along the entire length of the ridge line of the home. Ridge vents are perhaps the best type of exhaust vent because no hot air can get trapped above them. These vents are installed in the gable ends of the home or building. 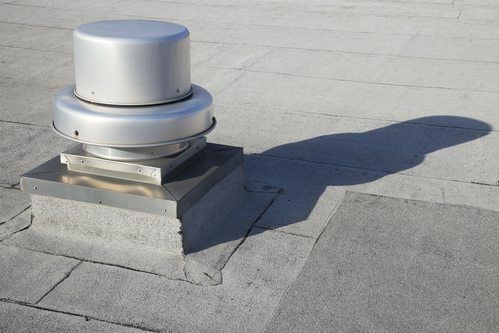 This type of vent works well for exhaust, but because the gable is below the apex of the roof, pockets of hot air may avoid exhausting by rising above the vent. Gable vents can be either motorized or nonmotorized. The soffit is also called the eave or the underside of the overhang. A continuous soffit vent installed along the underside of the overhang is the best means for intake ventilation, as cooler air continually moves into the attic through it. Dome or square-shaped roof vents are installed on the roof face itself. When higher up, they replace ridge or gable vents for exhaust. They are not commonly used for intake purposes. Now that you’ve explored some of your roof ventilation options, are you ready to ventilate your roof or attic? If you live in or near Springfield, Missouri, give GlennStone Roofing and Gutters a call. We understand how important attic ventilation is to the protection and value of your roof, and we can help you decide which ventilating system to purchase and have installed. With our help, you can rest easy knowing that you’ve selected the best ventilation products for your needs. For more information or some personalized advice, please give us a call at 417-860-8125, send an e-mail to info@GlennStone.net, or contact us online. You can even set up a free roofing ventilation consultation by requesting a quote from us today. We look forward to hearing from you!